Introduce your children to the sights, tastes and culture that Thailand has to offer with this holiday to Bangkok and the north of Thailand. We visit temples &amp; palaces in Bangkok, enjoy watching elephants in the jungle and tours in Chiang Mai, take an exciting long-tail river boat trip, and tour remote hill-tribe &amp; border villages in the Golden Triangle. The tour finishes with a local family homestay at Kanchanaburi and a visit to the Bridge over the River Kwai. This tour features less physical activities than some of our other family tours in Thailand, and concentrates instead on visiting more different sites and areas in Thailand, giving your family a comprehensive introduction to life in this fascinating country. The itinerary is designed to have a balance of tours, free time, and optional activities to make it suitable for families & children of different ages and requirements. We start in Bangkok staying in a family-friendly 5 star hotel to allow you to settle into the pace and new culture of Thailand in comfort. Our first tour takes in the spectacular Grand Palace complex, with an optional afternoon boat trip around the surprisingly green and peaceful canals of the Thonburi area of the city. An adventurous overnight sleeper train journey takes us north to Chiang Mai where we stay in a resort outside the city. An afternoon tour to the hilltop Doi Suthep temple enables us to learn more about Buddhism in Thailand, before we head down through forests into Chiang Mai itself where we visit its famous zoo with a wide range of animals in natural surroundings, including the only pair of Giant Panda in Thailand. Also in Chiang Mai we enjoy a jungle elephant ride and learn about the important role Elephants have in the history and culture of Thailand. Options are available to try a cookery course, or to visit more temples and sights by car or bicycle. 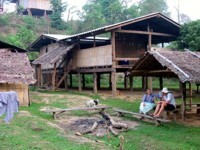 From Chiang Mai we hear towards the Laos & Burma border and enjoy an afternoon long-tail river boattrip to Chiang Rai. A full day tour from Chiang Rai takes us to several remote hill-tribe villages and the border trading village of Mae Sai, before we fly back to Bangkok. We drive straight from Bangkok airport to Kanchanaburi, site of the famous Bridge on the River Kwai. We spend the afternoon and night here in a local family homestay, and learn from them how Thai families live. After morning to the bridge, and a museum to learn about the important history of this site. You have the afternoon free to further explore this interesting town before we return to Bangkok to finish the tour. This tour can be followed immediately by our Wet & Wild in Thailand tour to make a longer holiday covering southern Thailand as well. We also offer extensions to Angkor Wat in Cambodia, or just to relax on the beach for a few days before flying home. Chiang Rai is an excellent base from which to explore the Golden Triangle - Thailand, Myanmar and Laos.